CoatingsPro offers an in-depth look at coatings based on case studies, successful business operation, new products, industry news, and the safe and profitable use of coatings and equipment. VENDOR TEAM BLASTRAC Surface preparation machines 13201 N. Santa Fe Avenue Oklahoma City, OK 73114 www.blastrac.com GRACO/GUSMER High pressure spray equipment P.O. Box 1441 Minneapolis, MN 55440 (877) 844-7226 www.graco.com MILWAUKEE ELECTRIC TOOL CO. Portable diamond grinders 13135 W. Lisbon Road Brookfield, WI 53005 (800) 729-3878 www.milwaukeetool.com POLYCOAT PRODUCTS Polyurea coating system 14722 Spring Avenue Santa Fe Springs, CA 90670 (562) 802-8834 www.polycoat.org SPY Holiday detectors Pipeline Inspection Company Ltd. 1919 Antoine Drive Houston, TX 77255 (713) 681-5837 www.picltd.com TYVEK Protective clothing DuPont Building 1007 Market Street Wilmington, DE 19898 (800) 441-7515 www.tyvek.com Dunkel says. "We were already shut down certain hours during the day because they were filming only a few feet away. Then an accident pushed Sandler's time frame into ours. It seemed we barely got set up and they made us stop for filming. We worked a lot of hours and did some straight-on-through work to make up for that." With prep finally complete, Aquatic Coatings dove into the coating process. The crew began with Polycoat Polyprime 21, a two-component, epoxy-polyamine primer. Before mixing the blue part A and yellow part B (2:1 ratio), the individual components were mixed thoroughly to ensure homoge- neous blending. 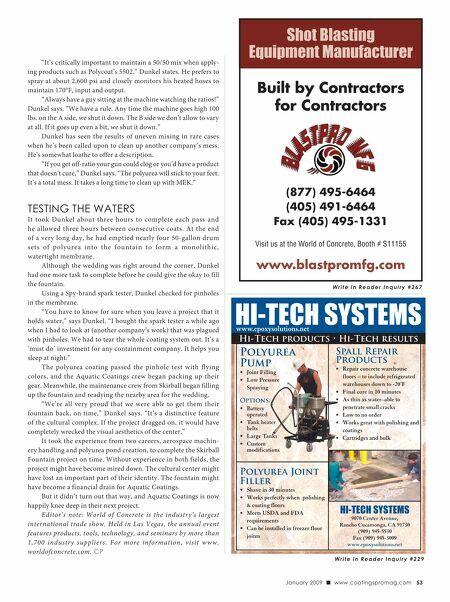 "We laid down in one pass 25 mils of Polyprime 21 using phenolic resin-core rollers with ¾-inch nap," Dunkel says. "We hit all the gaps, penetrations, angles, and returns for underwater lights with brushes. With the whole crew working, it took about three hours." 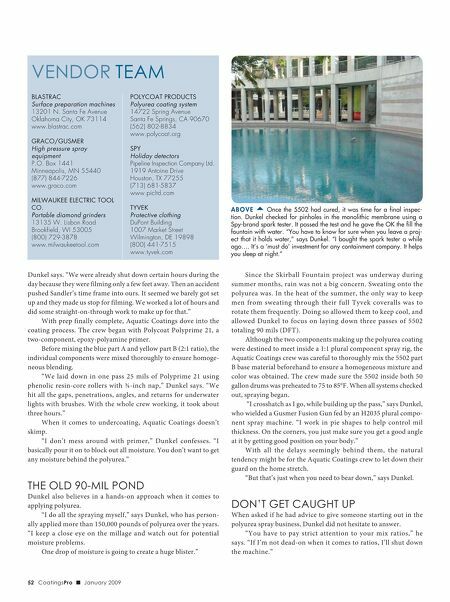 When it comes to undercoating, Aquatic Coatings doesn't skimp. "I don't mess around with primer," Dunkel confesses. "I basically pour it on to block out all moisture. You don't want to get any moisture behind the polyurea." THE OLD 90-MIL POND Dunkel also believes in a hands-on approach when it comes to applying polyurea. "I do all the spraying myself," says Dunkel, who has person- ally applied more than 150,000 pounds of polyurea over the years. "I keep a close eye on the millage and watch out for potential moisture problems. One drop of moisture is going to create a huge blister." 52 CoatingsPro J January 2009 ABOVE tion. Dunkel checked for pinholes in the monolithic membrane using a Spy-brand spark tester. It passed the test and he gave the OK the fill the fountain with water. "You have to know for sure when you leave a proj- ect that it holds water," says Dunkel. "I bought the spark tester a while ago…. It's a 'must do' investment for any containment company. It helps you sleep at night." Once the 5502 had cured, it was time for a final inspec- Since the Skirball Fountain project was underway during summer months, rain was not a big concern. Sweating onto the polyurea was. In the heat of the summer, the only way to keep men from sweating through their full Tyvek coveralls was to rotate them frequently. Doing so allowed them to keep cool, and allowed Dunkel to focus on laying down three passes of 5502 totaling 90 mils (DFT). Although the two components making up the polyurea coating were destined to meet inside a 1:1 plural component spray rig, the Aquatic Coatings crew was careful to thoroughly mix the 5502 part B base material beforehand to ensure a homogeneous mixture and color was obtained. The crew made sure the 5502 inside both 50 gallon drums was preheated to 75 to 85°F. When all systems checked out, spraying began. "I crosshatch as I go, while building up the pass," says Dunkel, who wielded a Gusmer Fusion Gun fed by an H2035 plural compo- nent spray machine. "I work in pie shapes to help control mil thickness. On the corners, you just make sure you get a good angle at it by getting good position on your body." With all the delays seemingly behind them, the natural tendency might be for the Aquatic Coatings crew to let down their guard on the home stretch. "But that's just when you need to bear down," says Dunkel. DON'T GET CAUGHT UP When asked if he had advice to give someone starting out in the polyurea spray business, Dunkel did not hesitate to answer. "You have to pay strict attention to your mix ratios," he says. "If I'm not dead-on when it comes to ratios, I'll shut down the machine."